O God, who gave increase to your Church through the apostolic labors and zeal for truth of the Bishop Saint Turibius, grant that the people consecrated to you may always receive new growth in faith and holiness. Through our Lord Jesus Christ, your Son, who lives and reigns with you in the unity of the Holy Spirit, one God, for ever and ever. St. Turibio, a Spaniard, served God from his infancy. 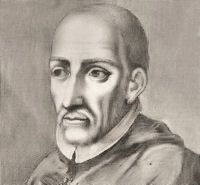 Appointed Archbishop of Lima, he landed in South America in 1581. He died March 23, 1606, having, by his indefatigable zeal and by the boundlessness of his charity, literally renewed the face of the Church of Peru. According to the 1962 Missal of Bl. John XXIII the Extraordinary Form of the Roman Rite his feast is celebrated on April 27. Historically today is the feast of Our Lady of Victories, (there are nine seperate days in honor of Our Lady of Victory, the main being October 7) Today's feast commemorates the victory in Hungary. On August 6, 1716, Prince Eugene of Savoy defeated a large invading Ottoman army at Peterwardein, Hungary. The victory set the stage for the reconquest of Hungary from the Turks. Together with Rose of Lima, Turibio is the first known saint of the New World, serving the Lord in Peru, South America, for twenty-six years. When the archbishopric of Lima in Spain's Peruvian colony became vacant, it was decided that Turibio was the man needed to fill the post: He was the one person with the strength of character and holiness of spirit to heal the scandals that had infected that area. He began the long and arduous visitation of an immense archdiocese, studying the language, staying two or three days in each place, often with neither bed nor food. He confessed every morning to his chaplain, and celebrated Mass with intense fervor. Among those to whom he gave the Sacrament of Confirmation was Saint Rose of Lima, and possibly Saint Martin de Porres. After 1590 he had the help of another great missionary, Saint Francis Solanus. His people, though very poor, were sensitive, dreading to accept public charity from others. Turibio solved the problem by helping them anonymously. Read more about St. Turibio. St. Turibio started the first seminary in the Americas, the (in Spanish) Conciliar Seminary of Lima, and was named the first male saint of the New World. Offer a rosary today for an increase in vocations and for those studying for the priesthood. 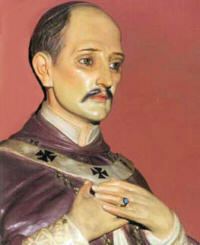 St. Turibio fought for social justice, championing the rights of the natives against the Spanish masters. Make a contribution to your local food pantry, volunteer at a crisis pregnancy center, cut out pictures of children from third world countries and make a display in your home to encourage your children to make sacrifices or to contribute money to the less fortunate. Cook a Peruvian dish in honor of St. Turibio. In 1432, John Hunyady, a Catholic Hungarian national distinguished himself at the Siege of the Szendro Castle in Hungary. For this very reason King Sigismund appointed him as one of his royal counselors. John Hunyady later became Count of Temes and supported the election of Wladislaw III of Poland, to the throne of Hungary. For supporting the Polish King, Hunyady was proclaimed Commander of the Fortress of Belgrade and Voivode of Transylvania. John Hunyady was privately devoted to the Blessed Virgin and prayed for her intercession during the wars against the Ottoman powers. Victories always occurred, following his prayers to Our Lady. In 1441, the Hungarians were victorious against the Ottomans at Szendro, at Maros-Szent-Imre in 1442, and captured Sofia in Bulgaria in 1443. In 1453, the Ottoman Islamists invaded the Christian territories, conquering Constantinople. Churches were demolished and the Byzantine Cathedral, referred to as Saint Sophia’s Cathedral, was desecrated and converted into a mosque. Following the fall of Constantinople, Sultan Mehmet II prepared for war against Hungary. In 1454, Serbia fell to the Ottoman Sultan. Together with the Franciscan monk, Father John Capistrano, John Hunyady marshaled an army at Szeged, and won back the territory at Szendro. The Ottomans pressed forward and Hunyady defended the Southern border of Hungary. Father Capistrano was ordered by the Catholic Pontiff to preach a crusade against the Ottoman invaders. On July 21 and 22, Father Capistrano and John Hunyady lead the Hungarian troops to battle. Invoking the name of Jesus Christ and his Blessed Mother, Father John urged the troops and led them to victory. The cleric was hailed as the ‘Apostle of Europe’ for the victory delivered on July 21, halted the Islamic Ottoman expansion for another seventy years. In 1690, Father Capistrano was canonized. Both Father Capistrano and John Hunyadi died shortly following the Battle at Belgrade where the miraculous intervention of the Blessed Virgin took place. John Hunyady experienced defeats and was at least twice captured by his enemies, in 1458 his second son became King of Hungary. Following the victory at Belgrade, in recognition of the heavenly aid granted by Our Lady, Pope Callistus III ordered the daily Angelus to be recited at midday, for that was the hour the Ottoman forces were defeated. In modern times the prayer of the Angelus is recited at midday commemorating the Catholic victory at Belgrade and in honor of Our Lady. Apart from Father Capistrano, a second Franciscan who saved Hungary from similar invasions was the Capuchin Father Mark D’Aviano. Following the successful defense in Vienna of 1683, the Battle of Budapest in Hungary, was the next place where the Ottoman Scimitar was to fall. Budapest capitulated to the Islamic Empire and a triple ring of fortifications was constructed around the city. The city’s Catholic Cathedral, dedicated to Saint Stephen, was similarly to Constantinople’s Saint Sophia, profanely converted into a mosque. Holding a large banner bearing the Image of Saint Joseph, Father Mark ran into the thick of battle. Once the bastions were breached, Father Mark entered the breach intending to reach the profaned cathedral. Fearlessly, ignoring the thundering cannons, he sang litanies to the Blessed Virgin and by evening he placed the banner of Saint Joseph in the reconquered cathedral. Following this victory, Catholic churches were once again rebuilt in this land and a short period of peace ensued. At the Battle of Essech, Father Mark encouraged the generals by assuring them a speedy victory. He postulated that in order to defeat such a formidable enemy, the recourse with confidence to the God of the Heavenly Hosts was necessary, “…without whom all human endeavor is vain.”(1) Although he was a cleric, Father Mark D’Aviano did not neglect the necessary and essential preparations for properly training troops, stocking ammunition, defining supply lines, speed when marching, efficient spying and the maintenance of a good diplomatic rapport between the Christian leaders. He advocated that: “The leaders must fight with upright intentions and not out of jealousy, pride, or personal interest.”(2) Belgrade was the next battle scene. When exposed to the grandiose power of the Ottoman forces the Catholic leaders faltered and hesitated, Father Mark insisted that even if such odds were against them, the Christians would be victorious. According to Father D’Aviano, armies could do nothing against the Ottoman Turk, but if Our Lady was worthily honored, she would intercede for victory. The battles were indeed won and the Ottomans ousted. In 1699, the Turks signed the Peace of Karlowitz. That same year Father Mark D’Aviano, passed away peacefully. The son of Prince Eugene Maurice of Savoy was born in 1663 and named Eugene after his father. Throughout his early youth he brought himself as an exemplary Catholic. Many at court thought that Eugene was destined at becoming an abbot, in fact he was referred to as the ‘petit abbe’ or the ‘little abbot.’ To the court’s surprise, Eugene developed a liking for the military but was denied entrance by the king. Eugene left France to enroll within the Austrian military, and was deployed where the most need was required, that meant against the invading Ottomans. In 1683, Eugene distinguished himself at Petronell and was appointed Commander of a Dragoon regiment. He served against the Ottomans at Buda and Belgrade. In 1690, the Ottoman Turks recaptured Belgrade and Eugene defeated the Ottomans at the Battle of Zenta. The 1699, the ‘Treaty of Karlowitz’ followed the victory. After Karlowitz, a short time of peace was welcome, unfortunately, the Ottoman Empire was not true to the treaty. The Empire ignored its pledges of Peace and invaded the West, retaking Morea from Venice in 1714. The Austrians declared war on the Ottoman Empire on April 13, 1716. Prince Eugene of Savoy defeated the Ottoman Turks at the Battle of Peterwardein on August 5 (Feast of Our Lady of the Snows) and Temesvar on the morrow of the Feast of Our Lady of the Pillar, October 13, 1716, he captured Belgrade. 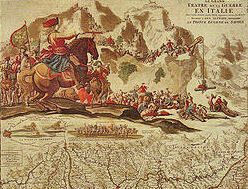 In 1716, the Battle at Peterwardein witnessed an Ottoman army consisting of 40,000 Janissaries, 20,000 Sipahis and 10,000 Tartars under the command of Grand Vizier Damad Ali. Battles started on August 3, and on August 5 the Austrian counter-attack under Prince Eugene began. The Austrians attacked by encircling the Sipahis and the Tartars, who gave way to the superior, disciplined army. Following this victory, Eugene attacked the Ottoman camp and was supported by the firing cannon of six frigates from the Danube River. In the Ottoman camps many were slain, including Damad Ali, their Commander. An event which was considered unusual for the time and season of the year, was a heavy snowfall on the morning of August 5, which covered Peterwardein. 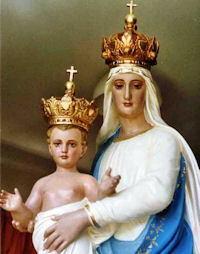 Prince Eugene sought the intercession of Our Lady of the Snows and following this victory granted by Our Lady’s intercession; he commemorated this event by ordering the construction of a church on Tekije Hill. The church overlooks the battlefield and is today known as ‘Our Lady of Tekije’ and ‘Our Lady of the Snows.’ The church is used both by the Roman Catholic and Orthodox denominations. On the morrow of the Feast of the Assumption of 1717, on August 16, the Ottoman forces were ousted from Belgrade. At the Treaty of Passarowitz on July 21, 1718, the Ottoman Empire ceded the Banat, Serbia, a portion of Bosnia and Vallachia to Austria. Learn more about Fr. Baker and Our Lady of Victory here. The Station is in the church of Sts. Peter and Marcellinus, two celebrated martyrs of Rome under the persecution of Diocletian. Their relics were brought to the church in 1256, and the church was restored the same year on order from Pope Alexander IV. Their feast day is June 2.